Its name is derived from the Basque word “zabal” which means “wide or wide bay”. It was a district of the Corregimiento de Chiquimula until 1866. In addition to the Spanish language, Q’eqhi’ and Garífuna are also spoken. Folk dances are performed in at least 2 of its municipalities. It is the perfect place to fish, dive, ski and practice all kinds of water sports or simply enjoy a good rest, surrounded by both natural and cultural beauties, in combination with visits to archaeological sites and contact with nature. It is a mainly agricultural department that is mainly dedicated to the cultivation of bananas, rice, corn and fruits. It has a rich ecosystem in a warm climate, which promotes a large vegetation that serves as a habitat for various species, making this region a Caribbean of great natural beauty. Here the ports of Santo Tomás de Castilla and Puerto Barrios are located, where ships, cruisers and boats dock, which in turn cross different rivers such as Ciénega, Zarco, Polochic, Sarstún and Río Dulce. The crafts made in this department are directly attached to the work they do, so we can observe fishing nets, we can also see handicrafts that are linked to their culture, such as jewelry, bracelets, key rings and earrings, where they use corozo, seeds and dyes to be able to make them. Garífuna culture stands out for the joy of its drums and other instruments, used for dances and rituals, produced by themselves, so they have become a benchmark for the production of drums, maracas, snails, shells and whistles. 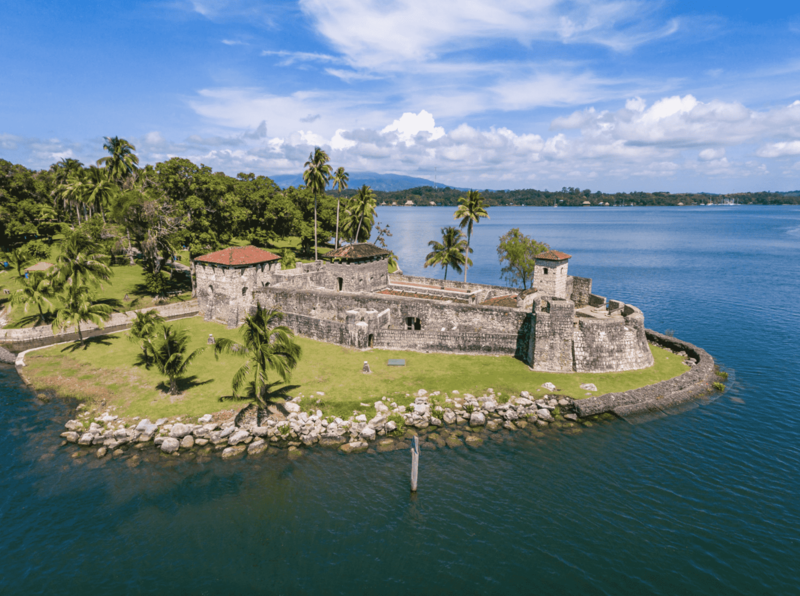 National Historic Monument, located at the mouth of the Rio Dulce, was erected to prevent the English pirates from entering the Guatemalan territory, since it had cannons that repelled these attacks that invaded the area, taking advantage of the country’s economic route. This monument served as a military center, prison and customs center and has also become one of the most important tourist sites in the area. It has guided tours to appreciate the facilities that have been restored, boats that give tours in its surroundings and from the top of the tower you can enjoy beautiful views of the place. It is the departmental capital of Izabal, which is 297 km from the capital city and is the starting point of the river route along the Rio Dulce. Here you will find the main shops, hotels, restaurants and nightclubs, as well as the different transports in which you can move the tourist to the tourist destinations that the place has. It is the largest lake in the country and is surrounded by beautiful beaches such as El Estor, Mariscos and Playa Dorada, so it offers the visitor a panorama of great beauty and the option of sailing within the lake. The lake has a variety of fauna, as we can find freshwater sharks, lizards, crocodiles, a variety of fish and specifically on its shores we can find the mammalian animal, the manatee. Afro-Caribbean population, settled at the mouth of the Rio Dulce to the Caribbean Sea. This area is accessed by sea from Puerto Barrios in private vessels. During Holy Week, you can see the Passion of Jesus live, you can also take the opportunity to visit it during the feast of San Isidro Labrador (November 26) and the feast of the Virgin of Guadalupe (December 12) which are magnificent opportunities to appreciate the folklore of the Garifuna population of the place, such as the dance of La Punta, the Zumba and the traditional and mystical dance El Yancunú. It is very characteristic of this destination to appreciate colorful and colorful traditional costumes of the Garífuna culture with its beaches of crystal clear waters, white sand, palm trees, striking wooden houses and a natural environment full of vegetation, making Livingston a unique place. The cuisine of this place is based on the most abundant product of the region, which is the coconut, which results in an unequaled Caribbean flavor, leaving in your palate the taste of the Garífuna culture. Among the main dishes you can find Tapado, being the most representative of the place, where seafood, fish and coconut flavors are mixed, as well as unique dishes made with fish and some others like coconut ceviche. Only 35 kilometers from the Río Dulce awaits you a wonderful experience, where you can use a canoe and walk along the water trail formed by the Sauce River, enjoying very close the fauna of the place that will amaze you with its sounds and colors, this is mixed with the caves that exist around them, that can appreciate and make you more aware of the environment, it is best to take a tour whispering to appreciate the place in its splendor, you can also observe a variety of flora and fauna, as well as listen to the howler monkeys that live in the trees that surround the site. The ecological park has different activities to perform in addition to its main attraction is the tour in cayuco, such as being able to submerge in crystal clear water, butterfly garden, hiking, horseback riding, rest in hammocks, observation of vegetation walls of more than 100 meters of height and enjoy the gastronomy of the area like tilapia, mojarras, shrimp and variety of seafood. A place, as the name says, paradisiacal. A farm transformed and adapted to receive tourists that is on the shores of Lake Izabal, with a restaurant where you can enjoy homemade meals, such as a delicious chicken soup, among other typical of the place. In the farm you can enjoy the lodging in ranches characteristic of the area, which make the visit to the place a pleasant experience. One of the main attractions of the farm are the pools, which can be reached by compact vehicle since the access is in good condition. These pools are fed by a river of cold water in which falls a hot water cataract, resulting in the experience of submerging in the pools is pleasant due to the warm, delicious and relaxing water. It is a small and beautiful peninsula that separates Amatique Bay from the Gulf of Honduras. In this Peninsula you can see a variety of ecological systems, flood forests, bays, marshes, beaches, mangroves and lagoons. This variety of ecosystems contributes to the appreciation of a great diversity of wildlife, being a very important refuge for threatened birds and mammals such as the manatee, the tapir and the jaguar. To reach this destination you must take a boat in Livingston and enjoy a tour full of vegetation and crystal clear water. Río Dulce connects Lake Izabal with the Caribbean Sea, making it an important biological corridor of more than 48 kilometers, this river is of great importance for species such as the manatee. The Río Dulce National Park has been a protected area in the country for more than 60 years. This park is essential for the Guatemalan fauna, since it is the habitat of the manatee, a mammal animal in danger of extinction. Its lush tropical rainforest on the banks of the Rio Dulce, offers a surprising landscape, which makes the region the threshold of the Green Caribbean and one of the main tourist destinations of Guatemala, since we can find a great variety of flora and fauna, with more than 40 species of amphibians, 87 species of reptiles, approximately 350 species of birds and more than 128 species of mammals. A place where I could meet the biodiversity of the Izabal region and its tropical forest by its trails listening to the sound of hundreds of different species of birds and then cool off in its crystal clear waters from Cerro San Gil. In the place we find natural pools of limestone that have small waterfalls that grant an exceptional landscape to those who visit the protected area of ​​47,432 hectares where more than 450 species of birds live. This is a destination where you can see the blue butterfly flying through the area, walk paths full of vegetation to enjoy contact with nature and enjoy a restaurant area. The park is located on the west bank of the Motagua River or Rio Grande, which was an important communication route for the Mayans. Quiriguá together with the city of Copán in Honduras are located in the southeastern periphery of the Maya lowlands. This Mayan city is characterized mainly by its majestic stelae that are the largest and best preserved of the Mayan World. Originally the city was under the rule of the dynasty of the city of Copán (now Honduras), but in 738 AD. the Quiriguá dynasty managed to become independent and even subjugate the Copán dynasty and it was when the city reached its peak. Most of the monumental constructions, the acropolis, and the stelae were erected during the following 60 years of reign of the new Quiriguá dynasty, a dynasty that dominated the region of the Copán river and the Motagua river. In this historical context, stela E is carved, 10 meters high and weighing 55 tons, which constitutes the largest sculpture of all those located in the Great Plaza, a ceremonial space where one can appreciate the exceptional collection of sculptural monuments of the park that It includes zoomorphic altars of exceptional artistic quality, which is why it has been declared a World Heritage Site since 1981 by UNESCO. The 34-hectare archaeological park protects an important remnant of tropical rainforest, which makes it a last refuge for wild species native to the area. It was declared a park in 1974 and is in charge of the General Directorate of Cultural and Natural Heritage of the Ministry of Culture and Sports.